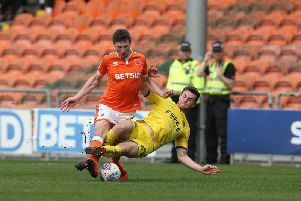 Fleetwood Town forward Conor McAleny wants to shoot down Blackpool and give the travelling Cod Army something to shout about this weekend. The 25-year-old’s late wonder strike at Oxford United in midweek clinched the three points that all but mathematically guaranteed Town’s League One status. He now wants to give the fans three points on derby day with more than 1,000 away tickets already sold for the weekend. The striker ended his goal drought at Oxford in emphatic fashion, scoring with a spectacular strike in the 93rd minute against the club for whom he figured on loan last season. He said: “They were piling on the pressure and we were under the cosh a little bit. “We’ve always been dangerous on the counter and that is what happened there. “As soon as it went in I was just buzzing. “It has been frustrating goal-wise for a few weeks for me so the lads were chuffed for me; it is good stuff. “As soon as I got the ball there was only one thing on my mind; get a clean strike on goal and luckily it went in. “I haven’t hit one like that in a while; it was coming too. It was McAleny’s first goal for Town since John Sheridan took over as manager. With just one defeat in that nine-game run – the 3-2 loss against Rotherham United which preceded the midweek win at Oxford – McAleny was full of praise for Uwe Rosler’s successor, who has also overseen half-a-dozen clean sheets. He said: “It is just all about getting three points, we are on 54 points and he (Sheridan) has done a brilliant job. “We’ve only lost one since he has been here and it has been positive. “It is how you bounce back from a loss and we showed that, the lads are pleased and we move on and go again. “We’ve been pretty solid since John has come in; I don’t think the defeat (at Rotherham) got to the lads too much. “We got the chance to put it right a few days later and we did that.